The 16th October was the night for Late at the Library: Felabration! A showcase that honoured the legend and man who coined the music genre afrobeat, Fela Kuti. Afrobeat is a formulation of high-life, jazz, funk, and psychedelic rock. Fela is renowned for his direct, outspoken and charismatic style; his lyrics were a reflection of the experiences and social issues faced by the people of Nigeria, and Africa. Love, colonisation, corruption in politics, and the state of black people were topics he expressed with West African pidgin English and chants, which made his sound translate across various cultures, and made his music known across the globe. London King’s Cross’ British Library stayed open later than usual to host an entertaining night full of energizing performances, which will never be forgotten. Demi Sosimi and Afrobeat orchestra opened the night, rocking the crowd with 3 of his own songs – ‘E Go Betta’, ‘No Long Tings’ and ‘Na My Turn’. The band was absolutely amazing and never missed a beat, the singers/dancers who performed throughout the whole night were also on top form; it was hard to take my eyes off of them as they wowed the crowd with their traditional attire and African dance moves. 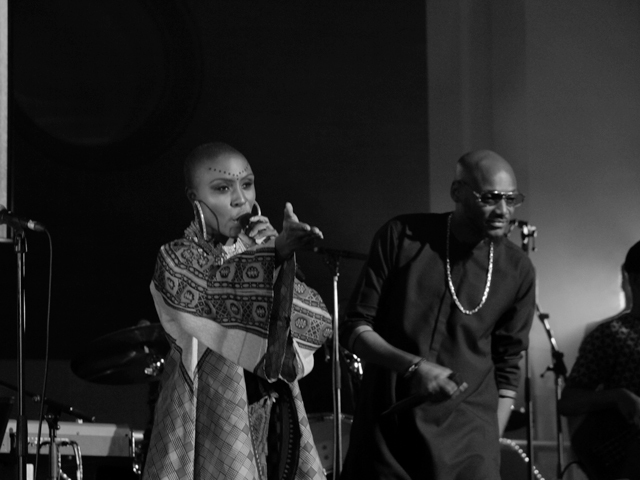 After his solo performance, Demi brought out vocalist Terri Walker, and one of my favourite artists, the Floacist (Natalie Stewart of Floetry, known for her gift of provocative wordplay), and together they gave a soul-moving rendition of Fela’s hard-hitting, ‘Zombie’. Nigerian artist 2face Idibia, well known for his hit-song, ‘African Queen’ made numerous appearances on stage and performed various songs with other artists. Laura Mvula and Bumi Thomas also gave wholeheartedly performances that allured the whole audience. Legendary drummer Tony Allen, who played alongside the Fela Kuti joined the performance as he masterfully controlled the sounds of the drum. Shingai Shoniwa’s performance was really electrifying as she gradually took her performance into crowd, ending with charismatic slide down British library’s escalator. Another key performance was Afrikan Boy’s rendition of ‘Black Man’s Cry’. I first heard about Afrikan Boy as a young teen with his song ‘Lidl’ blowing up the London Grime scene in 2007. His lyrics were powerful and dealt with the current social issues of black people very alike to Fela’s original version. This night was not just only for Fela fans, but for all music fans. It was great to see so many British based artists unapologetically embody their African heritage, and perform to celebrate one of Africa’s most treasured artists who championed free speech and Pan-Africanism. A big thanks to team at British Library, and especially Alice Carter who invited us down.